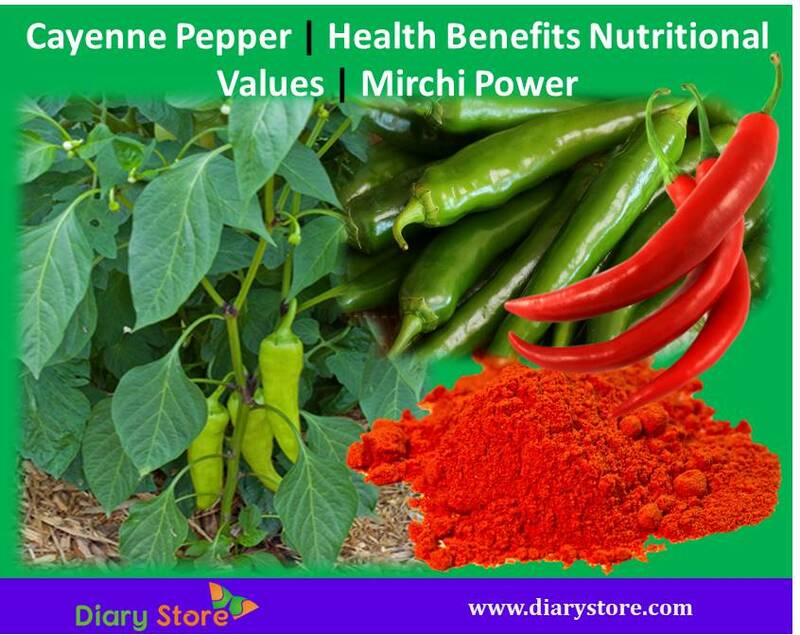 Cayenne Pepper is also referred to as Mirchi and Chillies. Chilli has a compound called capsaicin that makes chilli peppers taste hot. Chillies are main ingredient for preparing dishes in India. Chilli gives spicy flavor to the dishes. Without using Cayenne Pepper we cannot make the dishes delicious. It has amazing health benefits like weight loss, improves immunity system, digestion, blood circulation, lowers cholesterol levels, arthritic pain, reduce heart disease, and prevent cancer and headaches. Cayenne Pepper belongs to the Nightshade (Solanceae) family and the botanical name of Cayenne pepper is capsicum annuum. Other members of nightshade family are eggplant, tomatoes, potatoes, tobacco and bell peppers. The name Cayenne pepper gets from the city of Cayenne in French Guiana and the plant originated in Central and South America. Pepper is also referred to as hot pepper, red pepper, chilli and capsicum. 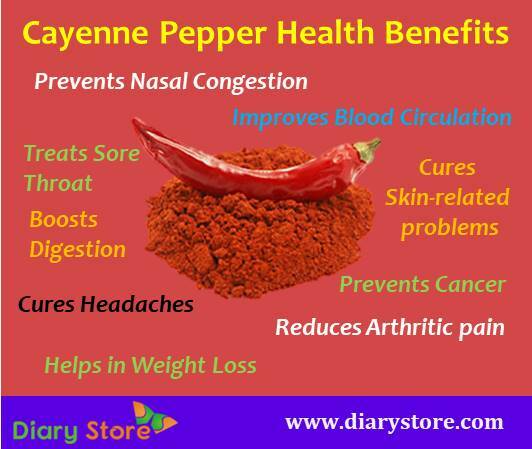 India, China, Indonesia, Turkey, Mexico, United States and Spain are the producers of cayenne pepper. Chilies are grown in both tropical and sub-tropical climates. The wide varieties are Cayenne sweet, Cayenne Buist’s yellow, Cayenne Carolina, Golden Cayenne, Joe’s Long, Cayenne Indonesian, Ring of Fire, Cayenne Long Thick Red, Cayenne Turkish, Egyptian Cayenne, Cayenne Violet and Cayenne Passion. Pepper is widely used in cuisines, soups and sprays and also used for medical purposes. When Cayenne Pepper is applied on the area of arthritic pain, it causes inflammation on the site of application thus distracting the painful sensation of the nerves. Blood clots are cleared by fibrinolytic activity stimulated by pepper which eases smooth flow of blood in arteries. Lipid deposits that block the blood flow in blood vessels are busted by the compound called capsaicin present in pepper. Uninterrupted blood flow in the circulatory system staves away blood pressure and eventual heart attacks. Cayenne Pepper activates salivary glands to produce saliva which is essential for good digestion and stops bad odour of mouth. It also triggers digestive enzymes in the system to streamline metabolic activity. When included in breakfast, pepper is found to reduce appetite thus enabling to consume few calories in a day. With the less intake of food and proper digestion of food already consumed, bloating of stomach is reduced and it functions as an active anti-flatulent agent. Excessive weight of the body is shed off by consumption of limited amount of calories and elimination of accumulated gas in alimentary canal and flushing out the toxic waste material from the body. Migraine pain is found to have subsided as cayenne pepper stimulates pain in other areas of body thus enabling the nervous system less sensitive to headache and nullifying heaviness of cluster headaches as well. Pepper has a useful inbuilt compound known as beta-carotene which can act as a good anti-oxidant capable of preventing/repairing the damage caused by free radicals. Hence, it inhibits atherosclerosis and colon cancer. When people suffer from sore throat, it is advised to use moderate quantities of pepper mixed in pure water and the liquid should be used for gargling to cure the soreness of throat. However, care is to be taken that the dosage of cayenne pepper does not exceed a certain limit so as not to cause burning sensation in the throat. When canals of nostrils and lungs are congested by mucus or phlegm, capsaicin present in pepper generates secretions which help to slacken or drain out the unwanted watery stuff from the body. Cayenne Pepper is found to be highly useful in treating skin ailments such as psoriasis. When the cream of 0.025% of capsaicin (cayenne pepper) is applied on the affected area, the scaling and the redness decreases over a period of about six weeks. In spite of several remedial benefits of cayenne pepper, it is always suggested to be cautious of its possible side effects in case of certain individuals. When the pepper is used as external application, it causes burning and itching which would last for a long time in some people. It is better to be extra attentive as the irritation caused by in nasal canal and buccal cavity would be for still longer periods. People suffering from dysentery or diarrhea are cautioned to abstain from using pepper to avoid worsening of the existing complications.